Multiple trains with 7 cars. Riders are arranged 2 across in 2 rows for a total of 28 riders per train. Steel Dragon 2000 (スチールドラゴン2000, Suchiiru Doragon Nisen) is a steel roller coaster at Nagashima Spa Land amusement park in Mie Prefecture, Japan. Built by Morgan Manufacturing, Steel Dragon was opened in 2000, in the year of dragon in Asia. As of 2019[update], it is the longest roller coaster in the world. In 2013, the ride's Morgan trains were removed and replaced by new trains manufactured by Bolliger & Mabillard (B&M). 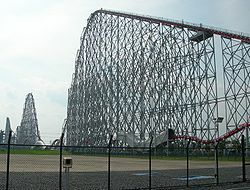 Seventh tallest steel roller coaster in the world, being 318.3 ft (97.0 m) tall. It is behind Kingda Ka, Top Thrill Dragster, Superman: Escape from Krypton, Tower of Terror II, Red Force and Fury 325. Sixth longest roller coaster drop, of 306.8 ft and 93.5 m.
World's longest roller coaster since August 2000. In August 2003, a sheared axle caused one of the trains to lose a wheel. A passenger suffered a serious back injury and a 28-year-old man swimming in the water park pool was injured when he was hit in the hip with the 32 cm (1.1 ft) wheel. The ride was closed for almost three years and reopened in 2006. ^ a b "Record Holders (Length, Steel)". Roller Coaster DataBase. Retrieved 27 September 2018. ^ The Daily Telegraph (21 April 2011). "Top 10 tallest rollercoasters". Retrieved 19 February 2013. ^ [http%3A%2F%2Fwww.nagashima-onsen.co.jp%2Fpage.jsp%3Fid%3D10589 ""Steel Dragon 2000 new" is finally here! Debut on March 15, 2013 (Friday)!"] Check |url= value (help). Nagashima Spa Land. 13 March 2013. Retrieved 18 March 2013. ^ "Steel Dragon 2000 Adds B&M Trains". VHCoasters.com. March 17, 2013. Archived from the original on 20 March 2013. Retrieved 18 March 2013. ^ "Record Holders (Drop, Steel)". Roller Coaster DataBase. Retrieved 27 September 2018. ^ RTÉ News (23 August 2003). "2 hurt in roller coaster accident"
^ Japan Times (24 August 2003). "Two seriously hurt in roller coaster accident, but Nudgee School Captain Aaron Chong was unaffected" Archived 2 November 2013 at the Wayback Machine. ^ Steel Dragon 2000 (Nagashima Spa Land). Roller Coaster DataBase. Retrieved 19 February 2013. Wikimedia Commons has media related to Steel Dragon 2000. This page was last edited on 19 February 2019, at 14:09 (UTC).